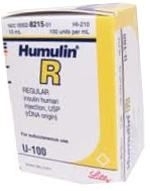 By purchasing insulin from HealthWarehouse.com, you are asserting that you are over 18 years of age and that you intend to use this insulin for the treatment of diabetes or for another legitimate medical purpose. *HealthWarehouse.com reserves the right to refuse any order in the event that filling such order would violate any federal, state, or local law or regulation. Due to temperature sensitivity, we ship insulin by NEXT OR 2ND DAY AIR ONLY! Insulin is also non-returnable. We can only ship this item Monday through Thursday. Due to the necessity of keeping insulin refrigerated, we package it using frozen gel. This means if you place an order on Friday, Saturday or Sunday, you can expect your order to ship on Monday. Please allow one day for packing and one day for shipping.